being little • bristol uk fashion & lifestyle blog. : red wine. 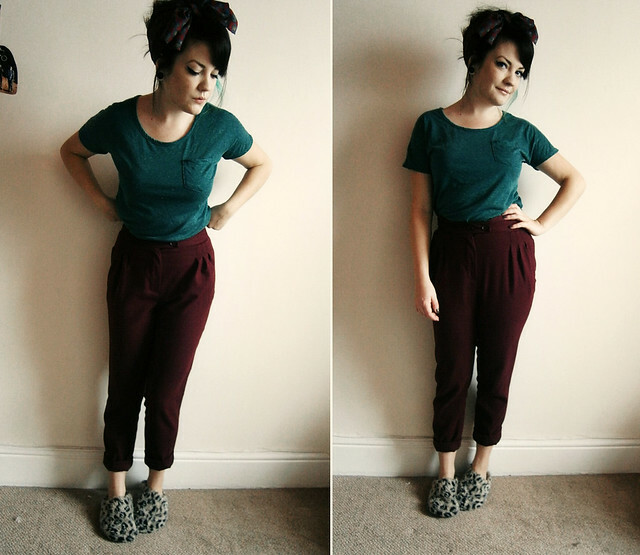 shirt - charity shop ; trousers - new look ; shoes - primark ..... haha awesome pose. I took these photos a few days before my operation, so that I'd have an outfit to blog about while all I'm really wearing is pyjamas... it seems I'm a little obsessed with this red wine colour at the moment, it's just so rich and warm. I got these trousers from New Look a couple of weeks ago when they had £10 off all trousers (not sure if they're still doing that deal, but it meant they were only £12.99!) and I LOVE them! The fabric is really soft and I love the shape. They really nip you in at the waist, and I somehow managed to fit into a size 8?! I think they're really versatile too. Here I'm wearing them really casual, but they'd probably look awesome with a sparkly top and some heels at Christmas! Speaking of Christmas - please please come to our Bloggers' Christmas Party! All details can be found here! 'Red, red wine, it's up to you. All I can do, I've done'got that stuck in my head now!! you look lovely! love the little tie shirt. loving these outfits so much!!! Love both of these outfits! 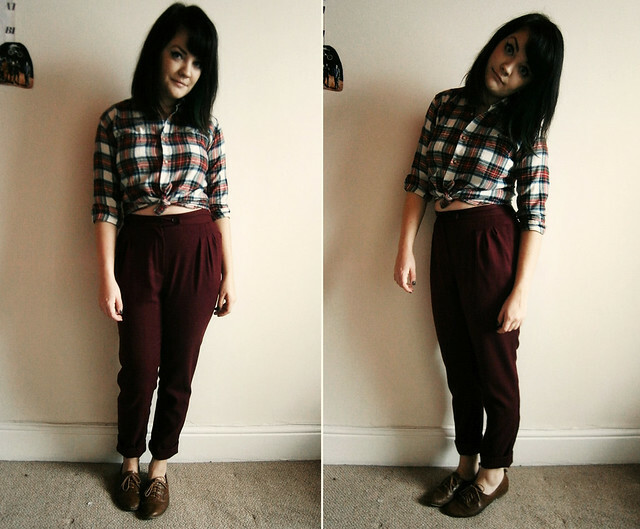 Really like the simplicity of both of them, and the colour of those trousers is gorgeous! I think the second outfit wins out though, for the colour combination, that fab head-scarf and even more fabulous slippers! They look awesome with the greeny tee and the headscarf. And the slippers look rather comfy too! Both outfits look SO comfortable!!! Love this outfit Lyzi! Think I remember you saying you wanted some burgundy trousers before in Bristol?! They look so nice, and what a bargain.